Jeannie Crane started singing at a very young age. Elementary school brought many opportunities to have solos in chorus and be involved in school plays. While starting the 6th grade, Jeannie wrote a song that she and her sister sang on the radio one evening in early September. The DJ (Larry Glick) from WBZ studio in Boston enjoyed it so much that he invited them to be guests on his show and record their song live on the air. In high school Jeannie started taking voice lessons when she was 15 years old and was a member of the Waltham, MA chorus, Jazz Choir and Show Choir. During her senior year she had the chance to travel abroad and sing in Belgium, Germany and the Netherlands as Ambassadors from the USA. After high school Jeannie studied Music Education and Vocal performance at the University of Lowell and Berklee College of Music in Boston. Jeannie had many performances in many groups throughout college. 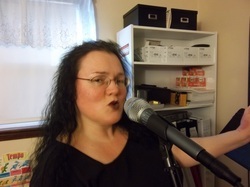 Jeannie has worked with many Boston bands, has sung at many weddings, has sung in studio sessions and has performed on the Esplanade in Boston.